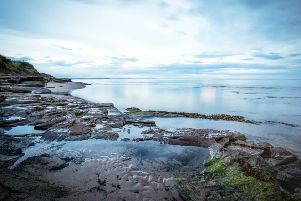 Cocklawburn Beach by Les McLean. On Tuesday, December 8, Morpeth Camera Club was delighted to welcome Les McLean AFIAP, who gave a presentation entitled Light, Colour, Texture, Style. Mr McLean has been described as one of the UK’s best fine art photographers and this was one of his last presentations in England before retiring. News of his presentation brought visitors from other clubs in the North East, many of whom were known to Mr McLean, which led to an evening of banter and laughter, especially when he told of his experiences, tricky situations and dialogues with characters he encountered. Once a miner, Mr McLean also travelled the country with his band, moved into accountancy, and in 1976 discovered photography. He set about learning the skills of making photographs by reading books, attending one or two workshops, exposing film and making prints. After several years soaking up information, teaching black and white printing and writing articles for magazines, the beginning of a career in photography was under way. Finally, in the early 1990s he gave up accountancy to concentrate on fine art photography and writing. Living in the Cheviots, Mr McLean showed images of beautiful snow covered valleys and images of Roughting Linn waterfall, explaining his use of shutter speeds. He led the audience through his journey of photography, with coastal scenes in Aberystwyth using multiple exposures, producing amazing detail, and landscapes in Zion Park, Utah, where he explained his treatment of cloud detail with the use of filters. Abstract shapes and rock layers in Antelope Canyon, in both monochrome and in vibrant colour, atmospheric scenes of Death Valley sand dunes in textured black and white and in contrast, and a study at sunrise of the same dunes in delicate grey tones were among the beautiful photographs he displayed. In his visits to Northern Ireland for a portrait project, we saw dramatic monochrome photographs of children in the Falls Road, street scenes and portraits of politicians and the people of Belfast — strong evocative images with a very interesting commentary on how they were achieved in sometimes menacing situations. A story to tell with every photograph, Mr McLean continued with colourful Gay Pride scenes, Iron Maiden concert shots in brilliant colour with smoke and lights, high key shadow and light patterns in architecture, and club and funfair scenes taken at very high ISO settings creating grainy, moody images. With such an eclectic range of subjects, from sharply defined graphic images of canyons and modern architecture, to soft, pastel studies of ripples over rock patterns, minimalist studies of light and shadow on snow, with thought provoking portraits, together with captivating dialogue, Mr McLean provided a truly enjoyable evening. Chairman Glyn Trueman thanked Mr McLean for putting on such a wonderful show and for his generosity in sharing his techniques, after which there was a question and answer session and an opportunity to view a selection of his wonderful prints. Anyone is welcome to attend three meetings with no obligation to join the club, with a charge of £2 per visit.